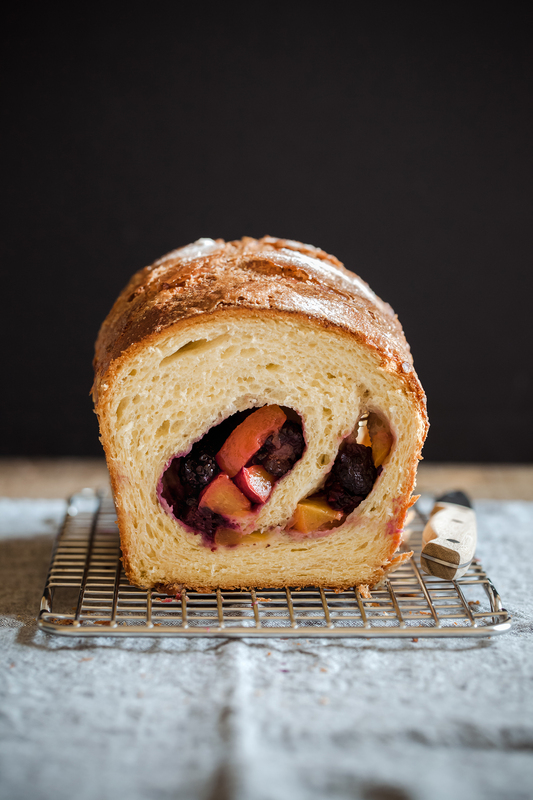 Today’s post is short and sweet: Peach & Blackberry Swirl Brioche. I had some requests to share this recipe on the blog, so here it is for you to enjoy on these last days of peach season. This fruit-filled brioche is superbly summery and completely addictive. I tested three different versions of this bread and my favorite way to eat it each time was to just slice it up and eat it as is. 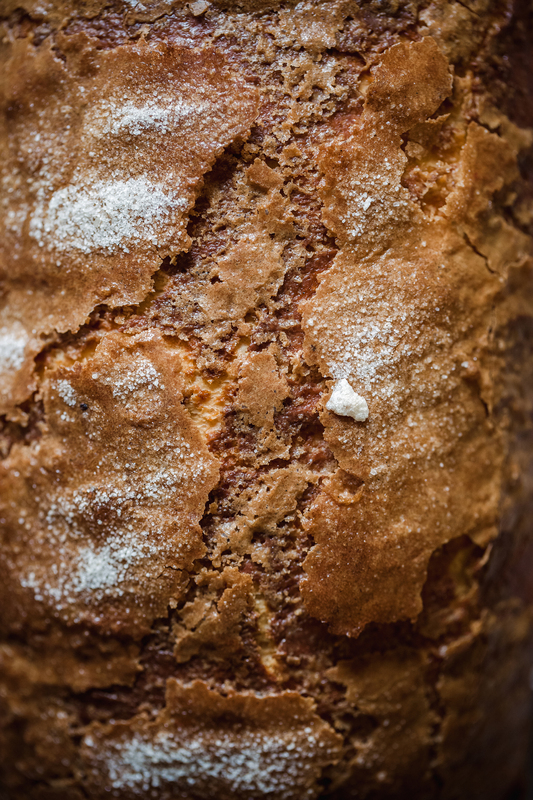 However, this loaf would also be amazing used as french toast for a weekend breakfast or a bread pudding. 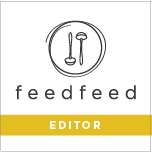 As the season turns to fall, substitute in caramelized apples, figs, pears, or whatever your tastebuds fancy. *Brioche is a dough that’s enriched with milk, eggs, and a good amount of butter. All this goodness creates a dough that’s stickier than a regular bread dough, so you’ll want to let it rest overnight in the refrigerator. This will help to firm up the dough making it easier to handle. If you don’t have overnight to wait at least give it 8 hours in the refrigerator. The next day, all it takes is to add the fruit filling, roll-up, rise, and bake. *When adding the fruit filling, be sure to keep the peaches and blackberries in the top third section of the dough. When the dough is rolled up this will become the bottom section of the brioche and will prevent the weight of the fruit from collapsing the brioche inside while cooling after baking. *I used vanilla bean sugar in this recipe since there’s a bunch of it in my cupboard right now, but regular plain sugar is ok to use as well. If you have a vanilla bean on hand, or any leftover vanilla bean pods, I highly recommend making vanilla bean sugar to store in your pantry. It can be substituted for regular sugar called for in a recipe and it tastes incredible. Plus, vanilla beans are crazy expensive nowadays, so it’s a great way to get as much for your money as possible. To make vanilla bean sugar, simply fill an airtight container with around 2 cups of sugar and bury an empty vanilla bean pod into the sugar (if making with a full vanilla bean just scrape the seeds into the sugar too). Place on the lid, shake it up, and let it sit indefinitely. Use as an equal substitute for regular sugar. Gently heat the whole milk in the microwave for a few seconds until warm to the touch, but not hot. Pour into the bowl of a stand mixer, with the dough hook attachment, and lightly whisk in the yeast. Add in the flours, 2 tablespoons of the vanilla bean sugar, salt, eggs, and egg yolk. Mix on low speed until dough comes together, about 1-2 minutes. Increase mixer speed to medium and mix dough for 6 minutes. Stop to scrape down the bowl as needed in order to thoroughly combine dough. On low, gradually add in the soft butter 1 tablespoon at a time; allowing it to incorporate into the dough between additions. Stop and scrape down the bowl and press the butter into the dough to help it along as needed. Once all the butter has been added, increase the speed to medium and mix for 5-6 minutes longer and well combined. Dough will be sticky and tacky. Transfer dough to a large clean bowl and cover bowl with plastic wrap. Place in the refrigerator, overnight, to firm up for easier handling. Next day, generously butter and flour a 9 x 5-inch loaf pan. 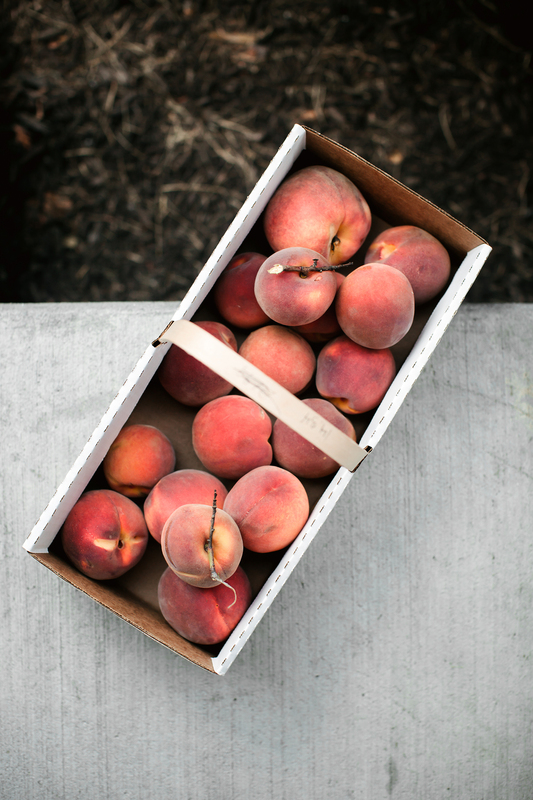 On a cutting board, slice peaches into 1/4-inch slices and cut larger blackberries in half. If peaches are on the larger size cut those slices in half too. Place fruit into a bowl and sprinkle with 2 tablespoons of the vanilla bean sugar. Lightly toss to coat the fruit. On a floured work surface, roll out the chilled brioche dough into a 16 x 10-inch rectangle. Position the dough vertically, with the short side nearest you; distribute the peach-blackberry fruit along the top one-third portion of the dough and gently roll dough down towards you to create a log shape. Gently tuck in the log ends to seal in the fruit. Transfer dough log to prepared loaf pan and sprinkle with 1 tablespoon of vanilla bean sugar. Cover lightly with plastic wrap and allow to rise, in a warm place, for 3 hours and dough has doubled in size. Preheat oven to 350F (177C). Gently brush brioche with egg wash (Tip: Make sure the egg wash doesn’t pool around the edges of the pan or it’ll stick to the pan after baking). Sprinkle on the remaining 1 tablespoon of vanilla bean sugar. Bake brioche for 45 – 50 minutes or until deeply golden. Remove from oven and let cool for about 10 minutes in the pan. Carefully remove baked brioche from loaf pan and let cool completely on cooling rack. Using a bread knife, cut into generously thick slices and enjoy as is or use for french toast, bread pudding, etc. Peach & Blackberry Brioche is best enjoyed on the day it’s made. In a small bowl, whisk together all ingredients and refrigerate until needed. Store egg wash for up to two days. Recipe adapted from Huckleberry by Zoe Nathan. Teresa, your recipes are scrumptious. I am already dreaming about french toast with this brioche. Please make them pinnable! This looks delicious and all of the advice is much appreciated. I absolutely love brioche, I’ve never stuffed it with fruit like this though. Thank you, Angela! The fruit filling makes it extra delicious and hard to resist. Such a heavenly brioche – I love that swirl!